We all have different sides of ourselves, living as we do in complicated times where what we do privately might be quite different from our public persona. Usually, it's harmless fun, but taken too far, it can lead to serious trouble. That's the case here in Other Lives, where four people who aren't what they claim to be manage to get themselves into a tangled web that involves terrorism, infidelity, plagiarism, and just a touch of insanity besides. Mix it all together, and you've got an explosive combination that ends up showing the best and worst of our protagonists...and their Other Lives. First of all, I have to give Vertigo credit for publishing this book that I'd have sworn up and down, from design to content, was actually from Fantagraphics. It's nice to see that DC was willing to do things outside their comfort zone, even if it's pretty clear that's no longer the case. (After all, you can't make a movie out of this and aging fanboys don't want to read about how their online identities are often skeezy and wreck their personal lives, so what good is it?) I did have to laugh, however, because however brief, we still get Vertigo Breasts, which I am pretty sure is a requirement by now. Thematically, this book most resembles what a Robert Crumb book might be like if he tried his hand at fiction rather than semi-autobiographical material or adaptations. The characters are ugly on the inside and out, staying just one step up from being difficult to look at. They're very real people, not all that unlike ourselves, but carrying traits that make them just bad enough that we can safely look at them and say, "That's not me!" (We'd never go online to escape a drab life or hold entire relationships with people we only know online or have horrible addictions or get so wrapped up in our ideas that we avoid reality. Oh no!) It doesn't surprise me to learn that Bagge was heavily influenced by Crumb, later even working with the man at some of his underground comics. The thing I liked best about this book, besides the fact that the story is very well plotted, with each piece of the puzzle fitting nicely together by the end, is that while things are certainly exaggerated, these are characters I can recognize, even if I wouldn't want to hang out with them. Their stories sound familiar, because we all know a person who spends too much time in World of Warcraft (or Second Life, which is clearly what this story is based on). When you are unhappy with your regular life, it's easy to find a place online where you can be happy. I think just about any of us that have had issues in our personal life have had places where we retreated to in order to stay sane, because the online world is far more accepting than the real one. The key is finding a way to keep the line drawn and in Other Lives, those lines are often not even considered. Even in the real world, character are lying constantly and pretending to be something they are not. Vlad/Vader, the main character, builds his life on a combination of lying and keeping the truth hidden, a trait he apparently inherited from his father. Woodrow ruins his life with a gambling habit and delusions that attempt to keep a marriage together, even as he has other plans. Ivy wants to be with Vader and be a good person, but she also wants to raise hell where "things don't count," learning far too late that they often can. Only Otis gets a pass in all this, because his illness drives his delusions. 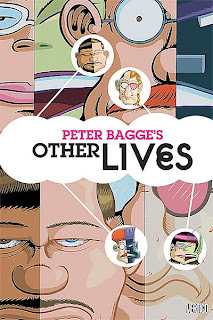 No one in Other Lives understands how living these various lies is unhealthy, and I think that's Bagge's point. We spend so much time trying to be who we are not and pretending to be the person we think others want us to be that we're tripping over ourselves. By thinking we have to show a facade to the world, we're all headed down a road to destruction. I hardly think people are going to die and end up in wheelchairs because we try to look better than we are, but how much emotional damage is caused because you're afraid to admit you like comic books to your co-worker and instead laugh while they're talking about the latest doings of Two and a Half Men? Bagge is best known for getting to the heart of the problems today's society through semi-autobiographical comics. He's doing the same thing here. Other Lives is both funny and tragic, like a good serious comedy should be. There's a lesson to be learned here, one that I admit I struggle with every day and am only in the past few years learning to manage. We need to accept who we are, and allow our true selves to shine through. Otherwise, whether by drinking or gaming or creating online avatars, we are going to drive ourselves all off a cliff. Trust me (and Bagge): You'll be a better person for it, just like Ivy and Vlad by the end of the book.